Barrichello - the best World Champion that never was, and a thoroughly nice guy also. Just imagine the abrupt change in life caused by no longer being a part of the F1 circus - and not something that you have chosen . . .
was originally applied to Stirling Moss, and thoroughly well deserved it was too! Is this not so subtle body language telling the story of who Martin Whitmarsh considers his number one driver? Based on last seasons results seems a reasonable assumption. Anyway.. back to the cars.. Caterham looks daft, the McLaren looks very pretty.. Ferrari we have established will be stuff all use if it snows..
Red Bull unveiling next week, when all the other designers look, gawp and think "Oh crap! never thought of that!" And for the conspiracy theorists.. anything to be read into the fact that the McLaren had Button's name on the side?? Button will carry a lower number than Hamilton due to his better results last season. Daft can be good, that means something will get banned. Pretty means "we won't win but we look good"
How in hells name does an organisation like Ferrari fail to get something to clear snow on their own test track when they know it's in an area where that damned Global Warming falls in winter!!! You have got that right SFFP. Hellsbrink,your pic looks like MW is looking at someone (probably JB) and saying "I better give LH a hug so he doesn't feel left out"
In reality I found the pic I posted on UK site and it was something that someone else (in the UK) said. Lewis does look a bit sheepish don't you think? I don't doubt that McLaren understand how fast Lewis can be but after his disastrous last year maybe they are trying to motivate him for this season? The only problem is that we all know how confidence in sport is all important so I hope for his sake that Lewis has a good result in the first few races.If Jenson beats him he will need all the help he can get. To be honest I sincerely hope that Lewis or Jenson (and wouldn't it be wonderful if Kimi as well ) manages to be a threat to SV at RedBull? SV will start with a truck full of confidence as will Jenson so if it will be interesting to see which car has the goods because there are probably between 4 and 6 drivers capable of winning IF they have the right machine and a reasonable amount of good luck. I did notice that Lewis has seemed to regained his sense of humour at least when he mentioned that Massa should be happy because the new McLaren has bigger mirrors this year. Informed sources (PitPass) reckon what appears at the first race will look nothing like that which was shown. They also hope the Caterham will look different. A few commentators have said that the front wings at least shown on most of the launch cars are there to stop their rivals from seeing the real item.However,after the first race the teams will probably be employing a few guys to do nothing more than examine and get photos of the other cars especially if they run away with a win in the first race so they can be copied. McLaren did it last year as do most teams I bet even AN will be keeping a close eye on the others. What I was really saying was that I hoping that another team would be able to step up to the plate and give RedBull some competition but yes it would be fantastic to see Mark giving Seb some competition.If he can do better in quaky and do better with his starts then who knows. chance of keeping up with Lewis.They thought that JB was over the hill as most do with Mark but the reality was that JB wiped the floor with his much younger team mate. Even better is another Australian racing full time this year and hopefully we will see some good results from him. OK there is the technicality of a few points between them, but 3 wins apiece.. hardly a floor wiping performance?? That said, whilst I love watching LH, and I hope Kimi does well this year, I am in JB's camp.. If that McLaren turns out to be quick my money is on him..
"Take no notice of old Lobes, for me tho 2 British F1 champs in the same team driving a British car well it gets no better than that"
So far the Mclaren appears to be the only new car without the duck billed platypus nose. Caterham, Ferrari and Force India all have the funny hump, mp4-27 has a smooth gradient. The Force India platypus appears to be eating! 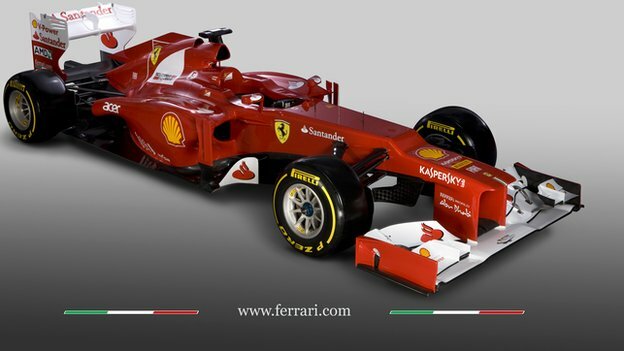 I would have immediately congratulated Ferrari in building the ugliest F1 car ever seen, but then I saw the Force India.. Still, if Gary Anderson is to be believed then McLaren have made a monumental error in nose design and will be left trailing..
Will be interesting to see the 3rd evolutions of these cars as they line up in Australia..
Oh and Montezemolo's remark about Massa - "Must do better or else!!" (Or words to that effect) brilliant.. another smash-tastic season for Felipe then! !